Indicators are ok - even if they do detract from the classic lines of the bike . . .
- but if they are going to be added to a bike why not do it properly and have a four-way hazard warning circuit? 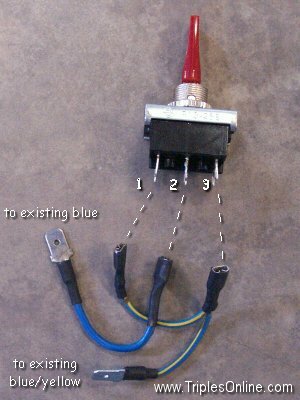 Here is an upgrade to the existing indicator circuit to provide hazard warning lights. Again, in keeping with our over-riding priority, there will be no permanent changes to the existing look or components of a stock bike. Obviously, this information only applies to those bikes that were originally shipped with indicators. Note: these directions are quite lengthy - to be as helpful as possible. For a quick overview first take a look at the wiring diagram and the photos. 1 The required components are shown below, along with suggested sources. We will take the electrical feed from the zener-diode (which is already fused but not controlled by the ignition switch). 2 Everything we do in this example will take place inside the front headlight shell and attached to the front indicator connectors - this means that to make this upgrade to an earlier bike with the flat 'pancake' style headlight shell will be difficult as there is very little room. It is suggested that these earlier bikes have the upgrade fitted under the seat and attached to the rear indicator connectors - you will have to find an alternative method of mounting the components and securing a source of power. Open the headlight shell and make sure you have enough room behind the headlight unit - if you have converted your headlight to a car style 3 prong connector it may be a tight fit. We are going to replace the existing headlight on/off switch (99-0563) at the top of the headlight shell because we need to add a double pole, double throw (DPDT) switch to work both the headlight and the hazard lights. - to the left will be our hazard light ON position. This position will also work the headlights - so we can have headlights and hazard lights. We will also wire it such that the hazard circuit will be 'live' or 'hot' when the bike is parked without the key. This is, perhaps, a personal preference - but don't be alarmed - any blue/brown circuit on your bike is always in this 'live' state (all bikes have this feed to the zener-diode under the headlamp and the T160 has an additional accessory connector under the seat). This toggle switch is also rather handy because it has a red toggle (in the exact style of the original) - the only visible indication of our upgrade. 3 A word on the connections we use. The typical spade connectors found on the Triples are 0.25". The new toggle switch comes with smaller terminals so we will have to use some 0.187" female connectors to attach our wiring - alternatively you can solder the wires directly to the switch. 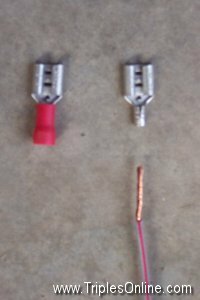 We use bare connectors (after stripping the existing and garish blue or red sheathing). 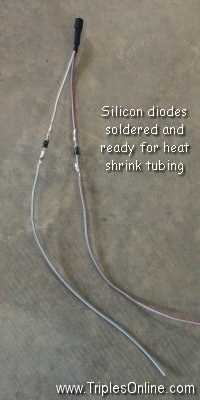 We assemble the components by crimping and then soldering for added security. We then cover them with black, heat-shrink tubing to provide insulation and a neat professional appearance. 4 The circuit is pretty simple. We take power from the zener-diode under the headlamp shell. We pass this through the (optional) fuse holder, on to the flasher unit, and from there to the toggle switch. We now have a fuse-protected flasher and switch and need to connect into the indicator circuits. 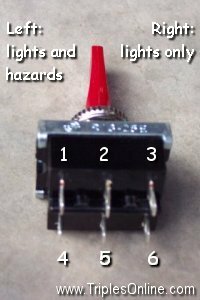 We obviously need to attach our new circuit to both indicators - however, while a direct connection would work for the hazard flashers it would also turn our original handlebar indicator switch into a hazard warning switch! We need a way to make our hazard circuit a one-way circuit for the flow of the current. Hence the use of the two diodes. 5 If we add a diode to each branch of the circuit as it leaves the toggle switch but before each wire goes into the respective front indicator bullet connector we will have isolated each circuit. See the wiring diagram and the photos. 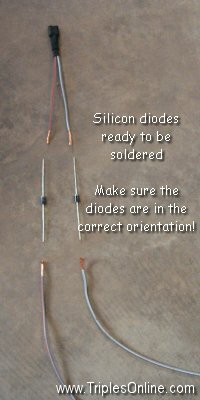 NOTE: the two diodes MUST be in the correct orientation - test before soldering! 6 First, we'll take care of installing the existing headlight circuit. Make up the wiring, shown right. Connect the blue input feed to the central terminal 2. Then connect the blue/yellow output wire to terminals 1 and 3 - this will allow the headlight to work with or without the hazard lights. 7 For the hazard circuit attach one end of the fused brown/blue feed to the flasher unit and feed the other end out of the headlight shell via one of the large black grommets. Attach it to the other brown/blue wire on the zener-diode. Attach the flasher unit to terminal 6 on the toggle switch and attach the diode wiring to terminal 5. Note that the original flasher unit and the hazard flasher unit might be on at the same time. This is not a problem electrically or in operation. The car-type flasher used in the hazard circuit will draw more current when turned on and operate (ie open) long before the reliable old Joe Lucas item. As it opens it will allow the Joe Lucas item to start warming up (it takes a while) - but before the Joe Lucas item gets up to a decent operating temperature to be able to open the bi-metal strip in the car flasher will have cooled down to close and therefore start the process over again - the Lucas item will never begin to operate.